Another season has come and gone, and I’m looking forward to next year. The Jennifer Gayle has a new home with a Native band in Puget Sound and is back fishing for Fraser River salmon. The new boat, Wyatt’s Torch, is a 40-foot Silverton yacht (46 feet overall). It’s working out to be a great charter vessel and I’m sure it will be a lot less maintenance for me. No more painting for three months a year, just a wash and a wax, as it has a fibreglass hull. You can see more photos on our Facebook group for Commercial Marine Charters. Transport Canada has certified the vessel as a passenger-carrying vessel of up to five persons plus one crew. I have had some major modifications done to the forward stateroom: I removed the large king-size berth and replaced it with four large single bunks. It looks and works very well. The living area is larger than the Jennifer Gayle, but of course the deck area is a lot smaller, but more than adequate — I had five halibut weighing over 600 pounds on it one day. 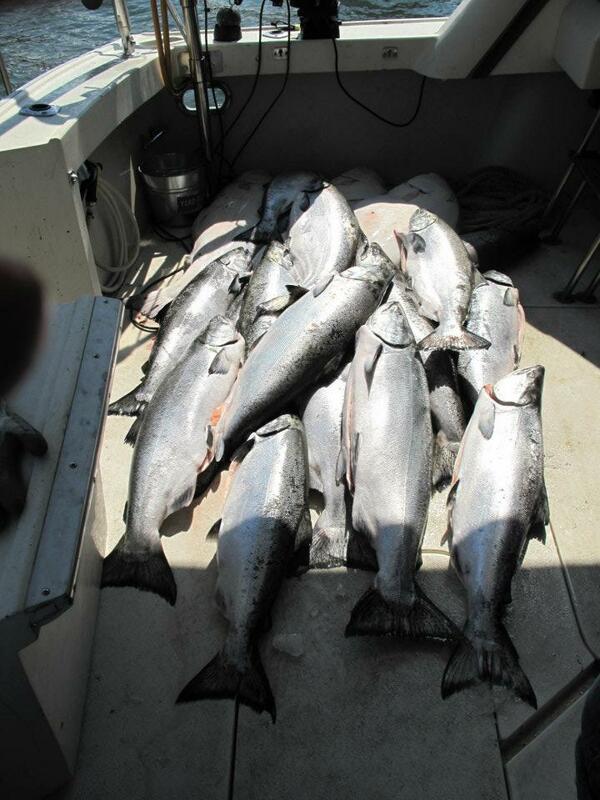 Our season was very productive; a lot of large springs all through the year and the halibut showed up in force once the pink salmon started to arrive. Coho salmon started to show very early and put on weight quite quickly: we caught one on Aug. 2 weighing in at 17.5 pounds. I did one trip in mid-May to a place called Anyox (which is north of Prince Rupert to the Alaska border) and had an unbelievable trip for large springs up to 45 pounds, as well as some good prawn & crab fishing (Dungeness and King crab). I plan on doing two, if not three, trips up there in 2012 from early to late May. On this year’s trip, the clients said it was incredible, saying the scenery and fishing were great, and that it was all inside waters so in most instances was calm. The rest of the season will be up to demand, early on the Charlottes or in the Rupert area. I will see what the response is and then decide, but I found the Rupert area had lots of good areas that could be fished no matter what the weather. I have had a steady interest for 2012 bookings, but still have days available, so if you and your group are looking to book for 2012, now is the time to book, and hopefully the days you want are still available. Rates for Wyatt’s Torch are $1,800 per day, and we can accommodate up to five guests. The Department of Fisheries & Oceans closed the halibut early this year, so if you’re interested in fishing for halibut, I would recommend that your trip be before mid-September (no guarantees that they don’t close it sooner). I am working on getting extra halibut quota for 2012. If you have any questions, or to book for next year, please email or call.